The iPhone is great, but it’s small. 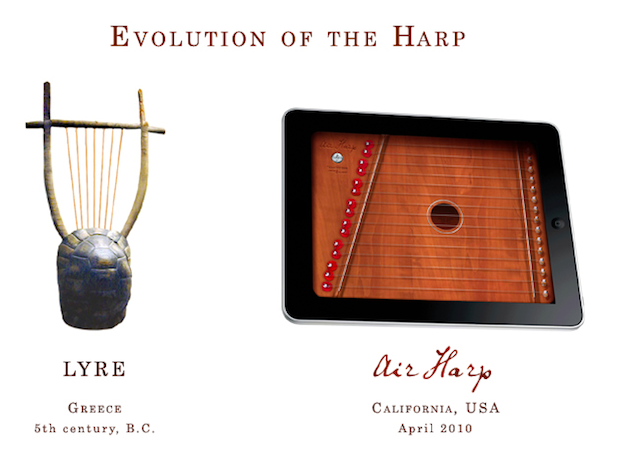 The iPad is bigger; you can cradle it, like a lap harp. Behold, Air Harp! If fart apps are what the iPhone is all about, Air Harp is what the iPad is all about. You can sit there, with the device in you lap, and simply strum. 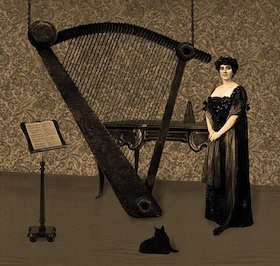 You get 2 octaves (15 strings) of tones in G Major. There are no shortage of musical instrument apps for the iPhone and iPod touch (Smule makes some great ones), but apps where you need to strum are tricky because the screen is so small. The iPad corrects that. I can’t wait for the first air guitar iPad apps (and the corresponding lawsuits when people start dropping them en masse). Watch Air Harp in action below. Developer touchGrove promises that it’s coming soon. I’m going to assume the iPad they’re using in the demo is fake, since Apple has those on complete lockdown still until Saturday.